Girl Scout Boating Camps are making a Splash! In a place like Colorado, it seems like we are blessed with endless opportunities for outdoor adventure. One thing that is rare though, is chances for aquatic experiences. This summer, GSCO continues the tradition of offering high quality boating camps for a truly unique Colorado water adventure! Are you new to boating? Or maybe you’re an old pro but can’t decide on a favorite specialty? Then the Boating Sampler camp from July 25th– 29th is for you! In this camp, campers get to try out a different boating specialty each day to get a taste of everything. Campers will rotate between canoeing, kayaking, sail boating, windsurfing and stand up paddle boarding- all taught by certified instructors and on the beautiful Soda Lake in Bear Creek Lake Park in Morrison. When not learning new boating skills, there will be plenty of time to splash around under the sun and enjoy the clue waters of this amazing area! If you’re a more experienced boater, or if you want to become an expert in your favorite type of boating, consider signing up for boating specialty camp from June 20th-24th! In this camp, participants will spend the whole week receiving in depth instruction in their specialty of choice: canoeing, kayaking, sailing boating, or standup paddle boarding/ windsurfing. Interested in GSCO Boating Camps? Contact Outdoor Volunteers Programs Manger Anna Danila, anna.danila@gscolorado.org for more information. Register now for a boating camp! Flood conditions have created unique volunteer opportunities for Girl Scout Troops at Bear Creek Lake Park. 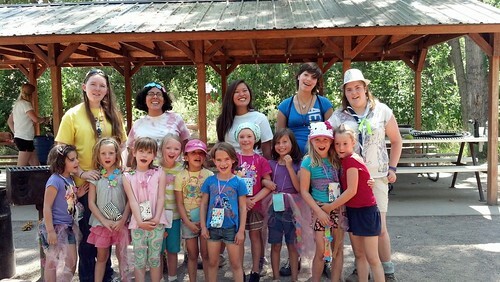 Bear Creek Lake Park has been a dedicated supporter of Girl Scouts of Colorado, we have had many day camps there over the years. They were on the news today about the catastrophic flooding at the park. The park was originally designed as a backup system to catch water flowing down from the mountains to protect Denver and the neighboring areas from flooding. Lucky for residents downstream, the park reservoirs did their job but the park is flooded. Bear Creek Lake Park is having an initial cleanup for the park on October 2nd 2013. This is one of many future volunteer opportunities at Bear Creek Lake Park in Lakewood. The park is in a holding pattern untill the water recedes for any cleanup or help. They will be looking for groups, etc in the spring and next summer to help with cleanup and repairs. Volunteer run day camp directors’ contact information will be published with their camps in the camp catalog so that parents can ask them directly regarding location changes due to flooding. Thank you to Judy Moisey-Asay, a dedicated boating volunteer, who brought this to our attention. This week Day Camp brought us to many new and intriguing places. Countries and Cultures week at Bear Creek Lake Park in Lakewood gave campers the unique chance to travel the world and learn about new costumes and cultures. The week began with a brainstorm session as girls talked about where they would enjoy traveling. Destinations that the girls were able to visit included parts of Asia, Africa, Europe, and the Polynesian Islands. Girls were immersed in these new places through food, music, and crafts. Snack time brought a chance for girls taste cheese from around Europe, and also featured an English-style tea party. Lunch was another creative way that campers experienced new places. Units prepared everything from a hearty poutine to Asian stir fry. Lunch was a fun and interactive experience for the girls every day this week. Along with food, campers delighted in creating arts and crafts from different countries and cultures. Campers made sarongs, Chinese lanterns, African drums, Mexican piñatas, and so much more. For two days this week camp had the pleasure of hosting Sara, a foreign exchange student from Spain. Sara is a Girl Guide back home and jumped at the chance to be a part of Girl Scouts on her visit to Colorado. It was a learning opportunity for both Sara and campers to talk about the differences in our culture, and we loved having her around. The week ended with a global buffet followed by interactive presentations from each unit. The buffet featured the classic all American hot dog, an eclectic fruit salad, a hearty helping of paella, and delicious dumplings. Presentations were presented camp wide and taught us about the culture of Kenya, China, and deaf culture. Girls walked away from camp with new knowledge and a new excitement for learning about our world.